Kilmarnock's players are determined to secure a top six finish to boost Gary Locke's bid to land the manager's job, according to striker Josh Magennis. Locke has been in interim charge since Allan Johnston was relieved of his duties in early February, and has targeted a top six finish. "Basically he said his job is in our hands," Magennis told BBC Scotland. "It's a results based business so we have to get results for him to stay as manager. Everyone wants him to stay." In Locke's two games in charge so far, Killie have picked up a 0-0 draw at Hamilton and beat Dundee United 3-2 at Rugby Park, leaving them eighth in the Premiership table. The former Hearts manager, who was assistant to Johnston at Killie, recently revealed he hoped a top six finish would lead to him being handed the manager's job on a full time basis. And Magennis added: "He [Locke] made it very clear on the day he took over what he wants to do. He called us in for a team meeting and it was very clear what his ambition was. "He made it clear what he expected from everybody and said if you're not doing it you're not going to play. He got everyone's attention and seems to have kept it by the way we're playing, and hopefully we can continue on and push for the top six, which was our target from the start of the season." 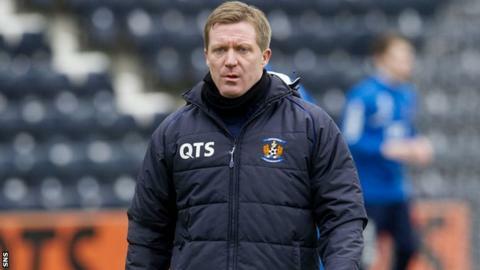 Johnston left Rugby Park on 6 February, having revealed his intention to step down at the end of the season the previous day. And Magennis revealed his departure left the Killie dressing room stunned. "We had no clue, we were in training and he was taking training just like a normal day," the 24-year-old added. "I was going to Craig Samson's [Kilmarnock goalkeeper] house and he rang me and said 'I have to do the whole interview again, the gaffer's said he's leaving at the end of the season'. "He hadn't told the players and it was a shock because normally you can sense when someone's not really in it any more, but he still had the same enthusiasm. "There was nothing at all and that's what baffled the boys - he should play poker because he has a great poker face. "Unfortunately when he said that, he put the board in a difficult position and there's only one winner and that's the chairman."